My father stopped over yesterday for a late afternoon visit. He kept me company on my afternoon carpool run, took in some snuggle time with Harper, stayed for dinner and entertained the boys with brain teaser games. He arrived carrying a frame. Clearly excited to give it to me, he insisted that he share the story about it before letting me see what it was. Having seen this hanging in a friends kitchen, he told me it was something he felt I had to have. This image hung in a frame in the kitchen of a friend whose wife battled breast cancer for years and eventually succumbed to the cancer and passed away. 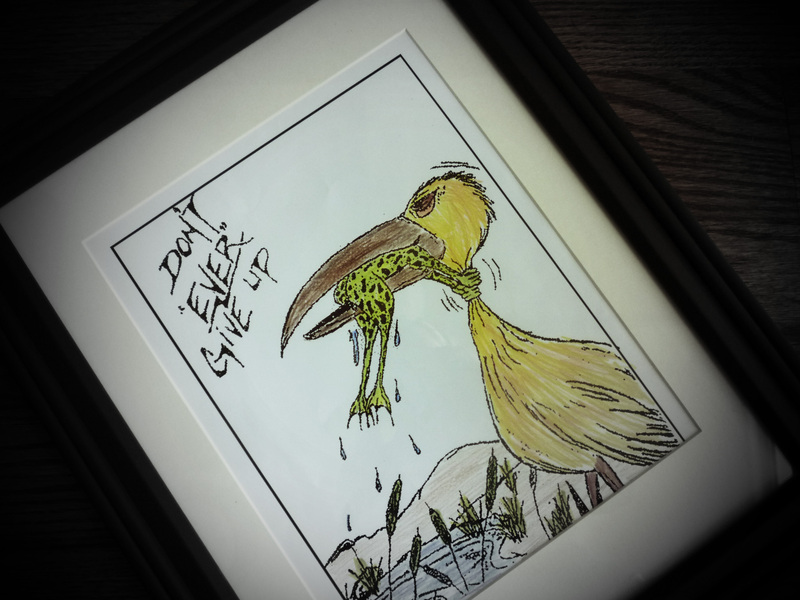 After her passing, it still hangs in his friends kitchen and serves as a daily reminder of an important life lesson. My father smiled and said it was something I needed to have, something I should always remember and a message to never forget. As I stood holding my breath in anticipation waiting to see what he had for me, he turned the frame over and handed it over with a big smile. He was right and yes, it’s a message I needed to hear again from him. It’s also a message for all of us. As I contemplated where it would hang, a spot I’d see it daily, it occurred to me that as a family it was a message we can all benefit from. It had been given to me, but in reality it was really perfect for all of us. A message Harper can grow up to understand. A message Tucker can find encouragement in as he rises each day to face and meet the challenges of coping and overcoming his dyslexia. A message Cooper can look to as he faces his own challenges over the years. A message of perseverance. As a family, we never give up. As long as we hold on, the pitfalls and potholes we encounter in life can never eat us whole. Thank you Dad. I love this. We love this and it’s perfect. Thank you. You are such an inspiration! I love reading every word you write. You are such an inspiration! I love reading every word. Seriously…. can you just write a book already??? Damn this is good! Love, Love!!! Keep it up. Not what I expected but very profound! !